Chores and bills have a great potential for creating tension between roommates. The best way to keep trouble at bay is being up front about expectations, everyday clear communication, and obviously discipline. If both of you are geeks, technology can make all of that a lot easier. This articles introduces you to online tools and apps to fairly split bills and organize household chores. We have previously profiles Bills Are In for our Directory . A similar tool is Splitwise, a tool that focuses on fairness. It offers calculators for rent, furniture, guests, noise, and travel, and it has the added bonus of offering mobile apps for Android and iOS. Moreover, Splitwise has a blog on which it provides insight and advice on various topics, for example how much to charge a roommates’s girlfriend. Chores have at least as much potential to cause trouble as bills. Who wants to clean the bathroom or take out the trash anyways? And why should I sweep the floors when I just cleaned the windows the other day? But of course everyone prefers a clean toilet and a nice smelling apartment. So there is a dilemma and in shared houses, things tend to go awry. 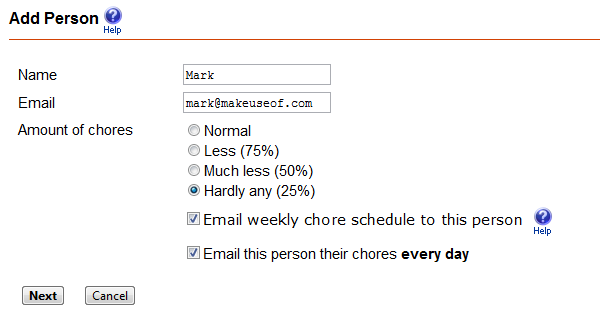 ChoreBuster is an online tool that can help organize chores fairly and keep everyone on track. First you add people, define how much their share is, what days they can or cannot do chores, and what times they are on vacation. Next you add chores, how often it should be done and how hard or undesirable a chore is, who should not do it, whether it is a shared chore, and a reward or payment, if any. ChoreBuster then automatically creates a schedule and emails it to everyone. You can see a demo of how the process works and we have profiled ChoreBuster for our Directory. A more simple tool is Upsees. It is far less detailed than ChoreBuster and not specifically targeted at people who share a place. It works for any group that shares tasks and needs reminders on a regular basis. Once a task has been completed, it is automatically re-assigned to the next person in line, which works great for chores. Upsees offers a mobile site.